The American Institute for Avalanche Safety and Education (AIARE) Level 2 Rec is a three-day/24-hour course that provides backcountry travelers an opportunity to advance their decision making skills in more complicated situations including: leading travel in small groups, traveling in more complicated terrain, and developing travel plans with limited resources. New to the 2018/2019 season the AIARE Rec 2 course has been designed specifically to meet the needs of advanced students who have taken an AIARE Rec 1 and AIARE Avalanche Rescue Course. The AIARE Level 2 Rec builds on the introductory avalanche hazard management model introduce in the AIARE Level 1 and adds to the evaluation of critical hazard assessment factors. 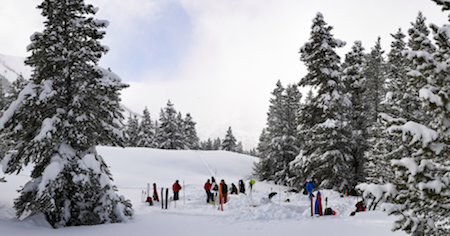 Students will describe and discuss weather, snowpack and avalanche process and identify how these processes relate to observations and travel within avalanche terrain. Differentiate where specific avalanche hazards exist within the landscape and identify avalanche terrain where consequences may be more sever. Use and interpret weather, snow and avalanche observations to locate appropriate terrain prior to entering and while in the field. Inclusions: AIARE Level 2 Course Manual, AIARE Field Book, AIARE Level 2 Rec certificate upon successful completion of course. A detailed equipment list will be provided upon course registration. *Avalanche safety gear and backcountry touring set-ups can be rented for an additional fee. Participants must have the ability to travel in avalanche terrain. An AIARE 1 Course and AIARE Avalanche Rescue Course are required before taking AIARE level 2 rec.